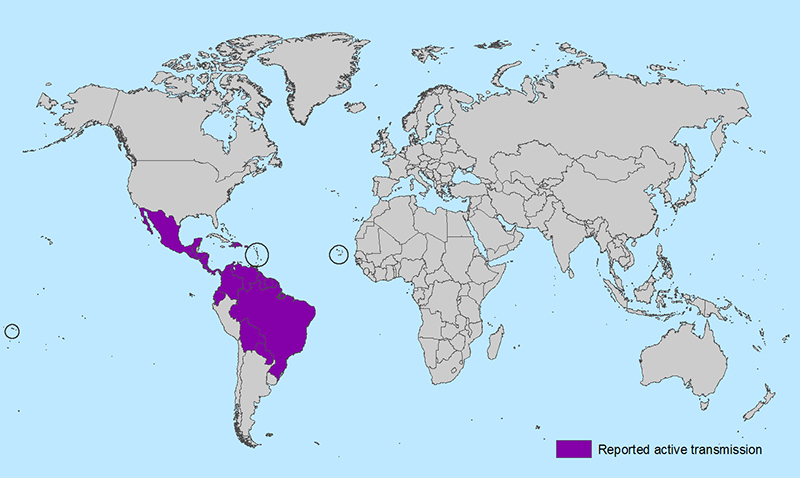 • Prior to 2015, Zika virus outbreaks have occurred in areas of Africa, Southeast Asia, and the Pacific Islands. • Currently, outbreaks are occurring in many countries. AMERICAS: Barbados; Bolivia; Brazil; Colombia; Commonwealth of Puerto Rico, US territory; Costa Rica; Curacao; Dominican Republic; Ecuador; El Salvador; French Guiana; Guadeloupe; Guatemala; Guyana; Haiti; Honduras; Martinique; Mexico; Nicaragua; Panama; Paraguay; Saint Martin; Suriname; U.S. Virgin Islands; Venezuela. OCEANIA/PACIFIC ISLANDS: American Samoa; Samoa. Earlier maps called: Zika-affected Areas.